Pyongyang, July 10 (KCNA) -- Kim Jong Un, chairman of the Workers' Party of Korea (WPK), chairman of the State Affairs Commission of the Democratic People's Republic of Korea and supreme commander of the Korean People's Army, summoned the officials of the Samjiyon County Committee of the WPK and had a significant photo session with them. He praised the officials of the Samjiyon County Party Committee for having taken the lead in the dynamic drive true to the idea and intention of the Party Central Committee for building the county, a sacred land of the revolution, into a model of the country and fairyland of communism, before having a photo session with them in front of the statue of leader Kim Jong Il in the county. Noting that a county in our country is very important as local base, he said that to strengthen the county is an urgent matter in realizing comprehensive prosperity of the country. The Party Central Committee attaches great importance to the duty and role of the county party committee, a hostess and staff which organizes and guides all the work of the county, he stressed. He stated that the officials of the county party committee should become core elements steeped in the idea of the Party Central Committee to the marrow of their bones and the county party committee should become the powerful driving force that accepts the Party policies in time and takes the lead in the efforts to carry them out. 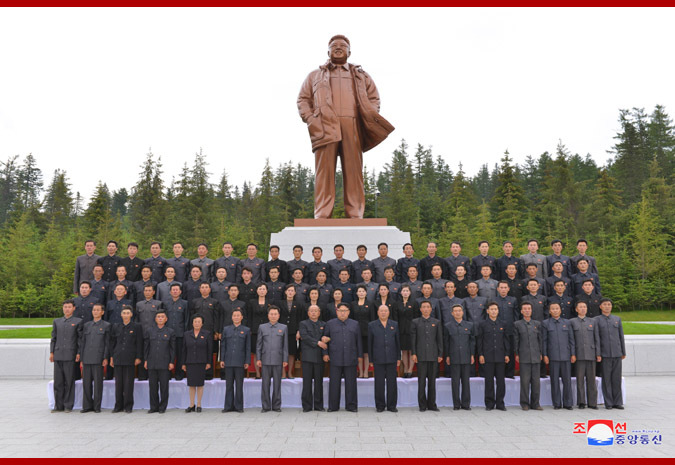 Hoping that the officials of the county party committee will be true servants of the people, he called on them to regard and uphold the people as Heaven and as leader Kim Jong Il. He earnestly said that the county party committee should be the home which the people frequent to tell of their inward thoughts and should take roots in the mind of the people. Saying that he would become a member of the Samjiyon County Party Committee to make contributions to sprucing up the county, a native place dear to our people, into the fairyland of the people best to live in our country, he ardently called upon the officials to work heart and soul for the modernization of the county with the mind to spruce up their own native homes.